Pendulum Scale 10 You cannot Pendulum Summon monsters, except "Deskbot" monsters. This effect cannot be negated. If this card is Normal or Special Summoned: You can target 1 Spell/Trap Card on the field; destroy it. 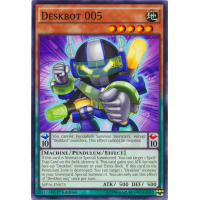 This card gains 500 ATK for each face-up "Deskbot" monster in your Extra Deck. 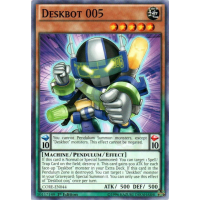 If this card in the Pendulum Zone is destroyed: You can target 1 "Deskbot" monster in your Graveyard; Special Summon it. You can only use this effect of "Deskbot 005" once per turn.